Hi everyone ; Today we are going to take a look at oh-so-chic fashion trend which is called denim jackets. We will see how to style it, how to mix it and make it stand-out the crowd. Denim Jacket Trend 2017.Denim is popular fabric that is trendy many years. This material is ideal for sewing various items of clothing, shorts, skirts, overalls and jackets course. Denim jacket is element of wardrobe of a woman who is considered very popular and without which today can’t almost any fashionable woman. This season will be in trend female short denim jackets. But fashionable girls who dislike short denim jackets can opt for a longer variant of denim jacket. Many models have been supplemented with original collar, sleeve length may be different as long or ¾ of them may be decorative. 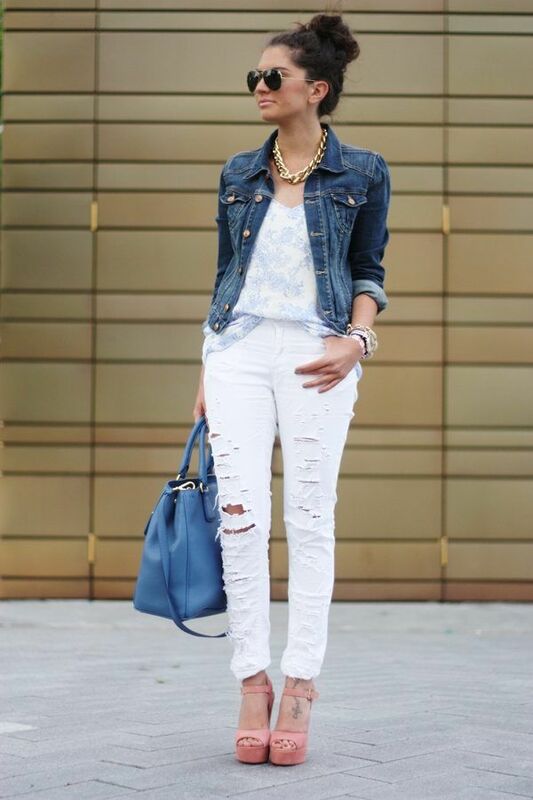 Denim jacket can be combined with any dress pants, jeans, skirts, dresses. With which clothes you will combine denim jacket depends of your style. Oh my god !! Eu adoro ganga !! Acho que combina com tudo , fica um estilo descontraído , jovem e muito fashion!! Parabéns pelo post !! !